Happy official launch day to Queer Books for Teens, a new website that provides a comprehensive database of LGBTQ+ young adult literature from 2000-2017! Kudos to the tireless team of librarians who has put this together and continues to add new titles. It’s an amazing resource for anyone looking for YA books with LGBTQ+ content. You can search for different kinds of representation, different settings, different genres, and ‘own voices’ authors. I know I learned a lot browsing the lists! When birds start to mysteriously fall out of the sky, Reese is in Arizona with her debate partner David and her debate coach. Soon, it becomes clear that something disastrous has happened all across the continent. Flocks of birds are going crazy everywhere. Dozens, perhaps hundreds of airplanes have crashed. Reese is stranded at the airport, and whatever the true nature of the disaster, the US government seems to be covering it up. Reese, David and her coach grab the last rental car available and start a dangerous cross-country trip to get home to the Bay Area, while all around them the social order begins to break down. Mobs raid stores. Military convoys and panicked refugees clog the highways. Soon Reese finds herself heading straight toward that most mysterious of places: Area 52. Then disaster strikes. And this is only the first few chapters of the book! In the aftermath of the national disaster, which comes to be known as the “June Incident,” Reese struggles to put her life back together. Something very strange has happened to David and her – something she does not understand and has been forbidden to talk about by shadowy federal agents. Reese is sure the government is watching her. She finds a surveillance device in her bedroom. Her best friend is running an investigation of government conspiracies for an underground website, whispering about secret programs and even . . . yes, aliens. The stranger her life becomes, the more Reese is tempted to believe his wildest wild theories. All of this would be crazy enough, but during the summer, Reese also meets the beautiful Amber Gray. Reese has been nursing a long-time crush for her debate partner David, though Reese also has told herself she has no interest in getting physical with anyone at this point in her life. Meeting Amber, Reese begins to question everything she has assumed about herself and her sexuality. But can she trust Amber? Can she trust anyone? 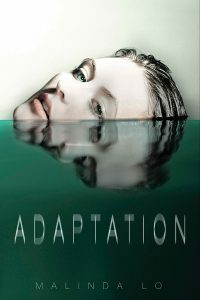 Part love story, part thriller, part sci fi, Adaptation is a great young adult page-turner that keeps you guessing and packs a lot of excitement! April Daniels’ superhero story really packs a wallop! Fifteen-year-old Danny Tozer has always known that she is a girl, even though she was designated male at birth. 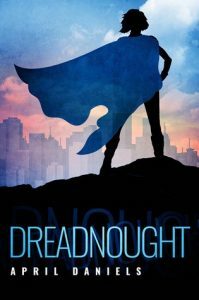 Then one day, by being in the wrong place at the right time, she inherits the powers of the world’s greatest superhero: Dreadnought. At the same time, she gets her greatest wish: a female body that matches her identity. But which challenge will be tougher: taking on the job of superhero, or finding acceptance from her friends and family who are suddenly confronted with her true, female self? In Danny’s home of New Port (an alternate Seattle) metahumans are everywhere, dividing themselves into white capes, gray capes, and black capes, but that doesn’t always mean you can tell the heroes from the villains. Does Danny step into the shoes of the great Dreadnought and become a white cape, or does her destiny lie elsewhere? As she tries to master her powers and explain to her friends and her parents how and why she has suddenly become the female she always knew she was inside, Danny gets pulled in many different directions by those who wish to influence her decisions. The white capes in their gleaming downtown tower offer unlimited resources and government support, but some seem reluctant to accept a transgender Dreadnought. The gray cape Calamity tries to teach Danny that crime-solving isn’t always a matter of black and white, but are her methods too violent and gray for Danny? And lurking in the background is the shadowy figure of a new super-villain, a black cape that somehow managed to kill the last Dreadnought, leading Danny to inherit his powers. Danny has to find this villain and discover how she managed to kill the supposedly invincible Dreadnought, so Danny won’t be next on the hitlist. This is a page-turning adventure that also explores identity and acceptance in a poignant, lovely way. Danny’s struggles ring true on every level, and any teen will relate. Fortunately, Dreadnought is the first of a series. I’m dying to read the rest! 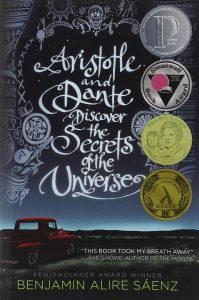 Aristotle and Dante Discover the Secrets of the Universe, by Benjamin Alire Sáenz. This book has won so many awards I could barely see the cover under all the stickers! After reading it, I understood why it gets so much praise. Sáenz tells the story of two young men, Aristotle “Ari” Mendoza and Dante Quintana growing up in El Paso, Texas during the 1980s. We follow their lives from age fifteen to seventeen, watching their relationship slowly grow, change and strengthen. 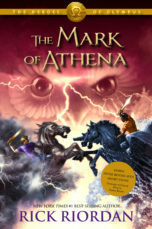 Told from Ari’s point of view, the novel is crafted in short, lyrical chapters. The prose sings. The dialogue is pitch-perfect. 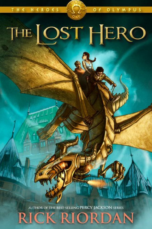 The story is quiet and gentle, but it pulls the reader through the narrative beautifully. Ari has loving parents, though his father silently bears the traumas of the Vietnam War, keeping him distant from his son. Ari’s sisters are a generation older, making him feel like the family mascot rather than an equal sibling. Most troubling of all, the family has erased all traces of Ari’s older brother, whom he barely remembers, who went to prison for a violent crime. Ari longs to know more and feels betrayed by his parents’ silence. Overall, Ari feels like his life “is a story written by someone else,” a sentiment I suspect many teens can relate to. 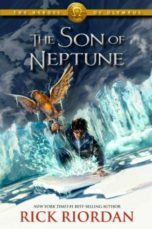 Ari has no real friends, nor does he want any, but in the summer of his fifteen year he meets Dante at the swimming pool, and Dante offers to teach him how to swim. They bond initially over their unusual names, but soon they are spending the bulk of their time together. We follow them through funny episodes, horrific accidents and tragic losses, watching their awkward and tentative friendship turn into the sort of bond that will challenge what Ari believes about himself and his capacity for love. I won’t give away the ending, but I kept thinking about it long after I finished the book. 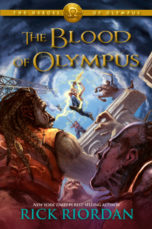 It didn’t end the way I expected it to, perhaps because of my own point-of-view and life experience, but I now see it ended the only way it could, as Ari learns how to reject the story others have written for him and write his life himself. This would be a great book club choice to spur discussions about identity and acceptance. Highly recommended. 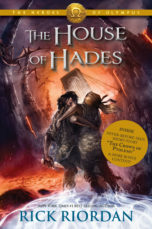 There are many more books cataloged on the Queer Books for Teens site, along with curated ‘best of’ lists, so check it out! And thanks again to the great group of librarians/contributors who put this together. It’s a wonderful service to YA readers!